Available exclusively from Memory Protection Devices, the patented Snap Dragon is an innovative “snap-on” coin cell holder that offers highly cost effective and ultra-reliable battery retention. 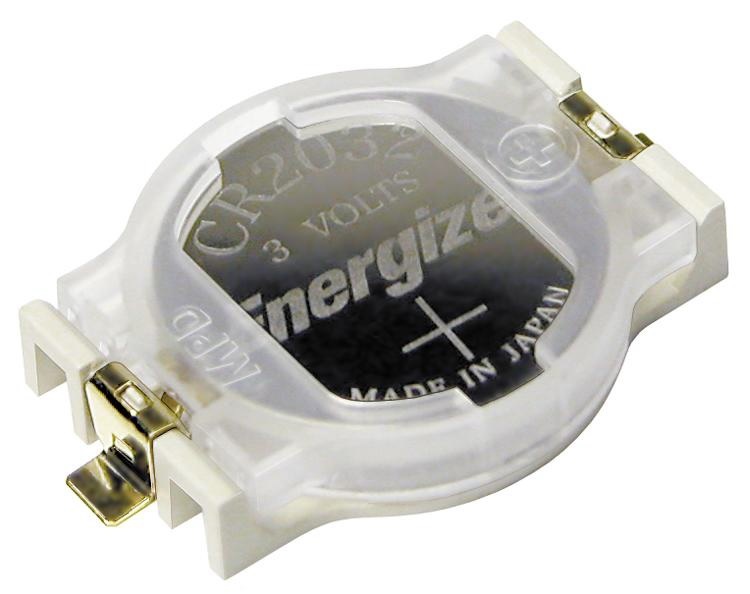 The innovative two-piece Snap Dragon coin cell holder is available in two different sizes to fit BR2032-CR2032 and BR1225-CR1225 cells or BR/CR2032,BR/CR1225 batteries. Snap Dragon can be supplied with tabs for SMT soldering, pins for thru hole mounting, or solder lugs for attaching wire leads. Snap Dragon features a base made of the highest quality virgin LCP plastic, which is both super thin and super strong, and is capable of withstanding the high temperatures associated with SMT soldering processes. The LCP base also provides excellent chemical resistance, and can withstand the environmental conditions associated with multiple sterilization cycles in medical applications, including hot steam, hot air, gamma/electron beam and ethylene oxide. The LCP plastic is also halogen-free, PFOA-free, and in full compliance with SVHC, REACH, RoHS, and WEEE regulations. The Snap Dragon also features a translucent polypropylene (PP) cover that provides highly reliable battery retention. The cover features pliable tabs that allow the battery retainer cover to be easily removed and reinstalled multiple times without distorting the plastic. This two-piece “snap-on” feature is especially valuable for use in medical devices that require the battery to be removed prior to sterilization, which may be necessary if sterilization cycle temperatures exceed the battery’s maximum rating for heat exposure. For added reliability, the Snap Dragon is constructed with dual pressure contacts made of gold-flashed nickel-plated phosphor bronze for improved electrical conductivity and added corrosion protection. The Snap Dragon’s dual pressure contacts feature extremely low electrical resistance and provide a snug fit to prevent CR2032, BR1225, or CR1225 coin cells from being dislodged as a result of shock, vibration, or mishandling. Looking for a low cost, ultra-reliable battery retention that can be removed in a snap? The answer is simple: Snap Dragon from Memory Protection Devices.